Teacher's Christmas presents are becoming extravagance. Teacher's Christmas presents are entering a new realm of extravagance. My mum used to have these little stashes of Quality Street choccie tins hidden behind the stack of Women’s Weekly and The Bulletin magazines piled up under the TV cabinet in our home. She would refer to them as her emergency stash. I never really knew what they were for and used to try and prize off the plastic seal in the hopes I could pinch a strawberry delight while everyone was watching Alf. Yesterday the penny finally dropped, it took 30 years to realise exactly what the point of having an emergency stash was for. It took 30 years to realise exactly what the point of having an emergency stash was for. This time of year it’s hard enough trying to remember to buy your relatives, family and neighbours gifts without having to add your children’s teachers to the mix. When you list all the different teachers your children have, from their classroom teachers, to the tennis coach, the ballet teacher, the after school care team, the basketball manager, the French teacher and the crew at the drama school that’s a whole trolley load of Quality Street. Listen to Holly Wainwright, Andrew Daddo and The Motherish&apos;s very own Valentina Todoroska talk about Teacher&apos;s gifts on this week&apos;s episode of This Glorious Mess. But these days the teacher&apos;s present has left the soap and chockies arena and entered a totally different ball game. In fact it’s not unusual for teacher’s gifts to be so extravagant they have to be declared to the asset register. 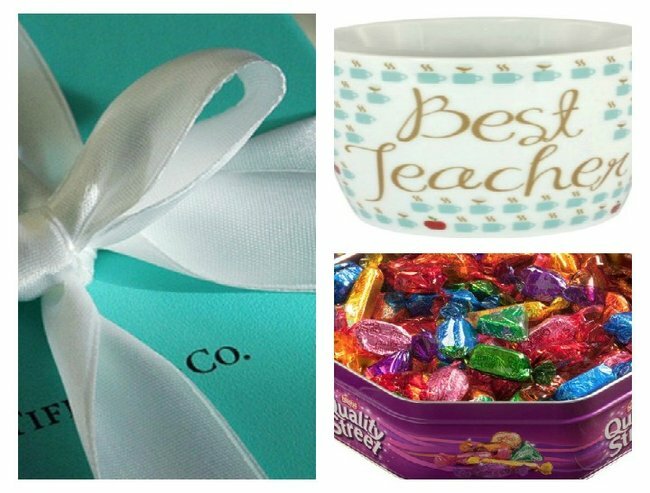 The biggest change in teacher’s gifts seems to be the all-in-one-gift, where one of those parents – usually one with much better organisational skills than me – volunteers to collect the contributions and purchase an agreed upon gift. In a school near us (one of those schools with a Latin motto and a crested motto) one class of 25 had each parent donate $50. The gift handed over with those homemade Christmas cards was, to say the least, mighty impressive. While the idea of giving a gift worth over $1000 seems over the top, it’s not unusual with teachers claiming to have received presents ranging from theatre tickets to nights out at luxury restaurants, all for the privilege of shouting at your children all year. The teacher&apos;s gift though doesn’t have to be something to be feared. Last year our class all threw in and got a hardware store voucher for my son’s year one teacher who loved woodwork, there was no set limit, no pressure to contribute and a card signed by all the children whether their family had contributed or not. What it boils down to is that on the whole us parents are in awe of those adults who manage a room of 25 children on a daily basis and we use this time of year as a way of saying thanks. As far as I can tell teachers gifts fall into one of these categories. A shopping centre, a movie voucher, or a meal out this one is a gift that will be appreciated no matter the amount. If you have the time and ability to hand make an apron with the names of each and every child stitched to the lining then I can only look on in envy. From mason jars filled with teeny tiny seeds to plant, to trays of home made baklava, if you have the skill there is a Pintrest page filled with ideas for you. And don’t you worry your crafty head about it I am sure there isn’t a teacher out there who doesn’t appreciate the homemade candle warmer. Here&apos;s an idea for the crafty type.. Post continues after video. You’ve read that twice right? But yes, I know of a very appreciative teacher who to her delight was presented with one of those aqua boxes one sunny last-day-of-school morning. It just made her day all the brighter. It just made her day all the brighter. Over the top? Maybe. But who wouldn’t be grateful for a token of appreciation Tiffany style? This is a recent trend I’ve notice whereby parents slather a $5 bottle of Aldi plonk with a label stating, “INSERT-YOUR-CHILD’S-NAME is the reason you need this”. I am sure it is drunk with glee. Getting all the parents to put their $10, $20 or even (yikes) $50 to a charity is the preferred gift experience of many teachers I’ve met. The soap/ the choccies/ the hand lotion/ the mug. I know you are wondering why the parent who would resort to giving a box of choccies just doesn’t try harder. I know you are wondering what teacher on earth actually appreciates a “WORLD’S BEST TEACHER” mug. But sometimes, just sometimes when life is hectic, reaching into the back of the TV cabinet at 9am on the last day of school is the just about what we can manage. You can listen to the whole episode of This Glorious Mess below, or subscribe in iTunes.